The discovery of the 2,700-year-old Ancient Thracian child sacrifice was announced on April 15, 2015, after the archaeologists conducting rescue digs along the planned route of the Struma Highway in Southwest Bulgaria found two crushed skulls and a shoulder bone in one of the some 20 Thracian ritual pits located on top of the 8,000-year-old Early Neolithic city near the town of Mursalevo. Now that the archaeologists from the National Institute and Museum of Archaeology of the Bulgarian Academy of Sciences have excavated the pit further, they have uncovered the rest of the first two child skeletons, as well as a third child skeleton, reports the Bulgarian private news agency BGNES. On Monday, the archaeologists packaged the remains of one of the children sacrificed by the Ancient Thracians; the other two skeletons are still being cleaned up, and will also be packaged. All three Thracian children’s skeletons will be examined by an osteoarchaeologist, a specialist in the study of excavated human or animal bones, from Edinburgh, Scotland, who will be enlisted to help his Bulgarian colleagues. “We don’t have an osteoarchaeologist in Bulgaria, that is why we will have one arrive from abroad,” says Assoc. Prof. Krum Bachvarov, one of the lead archaeologist of the rescue excavations at Mursalevo and head of the Department of Prehistory of Bulgaria’s National Institute and Museum of Archaeology in Sofia. Some 20 such ritual pits in which the Ancient Thracians placed artifacts or food as sacrifice to their gods, or sacrificed animals or humans, have been found on top of the Early Neolithic city near Mursalevo. In the fall of 2014, the archaeologists discovered that one of the pits contains the complete skeleton of a sacrificed calf, with its head pointed down so that it could bleed out, and a knife blade left next to it. Several more skeletons have been discovered at Mursalevo so far but they are from the Late Neolithic period. Out of a total of four prehistoric graves found there after the discovery of the prehistoric city in 2014, three are adults’ graves dated back to the end of the 6th millennium BC, and one is a prehistoric child’s grave from the middle of the 6th millennium BC. Three more Late Neolithic graves have also been found, and are currently being researched. 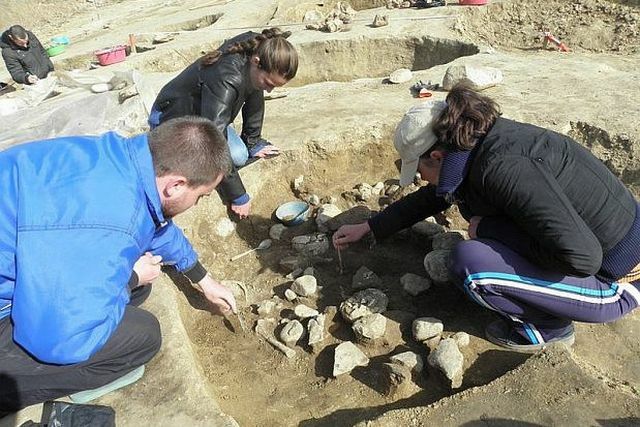 On April 4, 2015, the Bulgarian archaeologists resumed the rescue excavations of the unique Early Neolithic settlement near the southwestern town of Mursalevo, Kocherinovo Municipality. It was discovered in April-May 2015 as they were carrying out rescue digs along the route of the Struma Highway. The excavations of the Early Neolithic settlement near Mursalevo, which is dated to about 5,800 BC, are led by Prof. Vasil Nikolov from the National Institute and Museum of Archaeology of the Bulgarian Academy of Sciences. The rescue digs near Mursalevo first started in April 2014 in order to clear the way for the construction of Lot 2 of the Struma Highway, which will connect Bulgaria’s capital Sofia with Greece. However, as the archaeologists uncovered ever more impressive finds, the Bulgarian government extended their excavation period twice – once in August and once in November, when it was decided that the digs would be frozen for four months during the winter. Now the Bulgarian archaeologists researching the prehistoric settlement near Mursalevo have until the end of June 2015 to complete their excavations. The Early Neolithic settlement near the town of Mursalevo in the District of Blagoevgrad covers an area of 16 decares (app. 4 acres) making it the prehistoric settlement with the largest excavated area in Southeast Europe, which is the first European region to see civilized human life. The 8,000-year-old settlement near Bulgaria’s Mursalevo consists of three parallel major streets, including one main street, and several smaller streets that are perpendicular to them which form sections with 3-4 homes each. The Bulgarian archaeologists have been impressed with the perfect alignment and “urban” planning of what they have described as a prehistoric city. The Early Neolithic homes at Mursalevo were built of plant stalks and clay, and have walls of 20 cm in width. Some of items found there include ceramic figurines of the Mother Goddess, tools, a golden ear decoration, a button and a needle, a Late Neolithic grave with a skeleton in the fetal position. The archaeologists have also discovered that the site of the prehistoric city was deemed sacred by the Ancient Thracians who between the 6th and the 1st century BC dug up dozens of pits there in which they conducted rituals and sacrifices. Some kind of a museum exhibition, possibly in situ, is expected to be created out of the finds from the Early Neolithic settlement near Mursalevo. There have been calls for changing the route of the Struma Highway as it is planned to pass right through the middle of the Early Neolithic settlement but so far the Bulgarian government has not indicated that this might be possible as the constraints range from the rough and mountainous terrain in the Kresna Gorge to the strict EU rules as the highway construction is financed with EU funding. The Early Neolithic settlement near Mursalevo, Blagoevgrad District, in Southwest Bulgaria was discovered in May 2015 (even though the spot has been known as an archaeological site since the 1930s) by a team of Bulgarian archaeologists led by Prof. Vasil Nikolov from the National Institute and Museum of Archaeology of the Bulgarian Academy of Sciences. It is dated to about 5,800 BC. The Bulgarian archaeologists found there at least 20 prehistoric buildings with perfect alignment whose walls are 20 cm wide and made of plant stalks and clay. They believe that the buildings were burned down deliberately in arson after firewood was stocked inside them. On the same spot near Mursalevo, the archaeologists have found a Late Neolithic grave with a skeleton in fetal position, artifacts such as tools, figurines, and ceramic vessels, as well as dozens of Ancient Thracian sanctuary pits for rituals and sacrifices from the 5th-1st century BC; it is thought that the Thracians deemed the spot of the former prehistoric settlement a sacred place. Hi, Thank you for your comment. Check out the preceding story: http://archaeologyinbulgaria.com/2015/04/15/bulgarian-archaeologists-find-ancient-thracian-child-sacrifice-during-excavations-of-early-neolithic-city-at-mursalevo/ The archaeologists have found ritual stones that were apparently used for the ritual murder. The discovered skulls and bones were crushed with them. Apparently, what they discovered fits with previous discoveries about human and child sacrifice by the Thracians. The Ancient Thracians were weird in the sense that they cheered when someone died and mourned when a child got born. They believed the human life boiled down to suffering and unhappiness, while the afterlife was happy and wonderful.